British Gas Energy Trust was established in 2004 as an independent charity to help people in fuel poverty to pay their energy bills, get back on their feet and remain debt free. 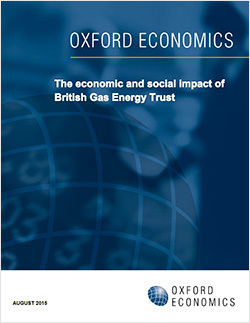 Having recently marked its tenth birthday, this report explores the difference that the Trust has made in its first decade of existence by examining the scale and nature of its economic and social impact. The study was launched at the National Energy Action Conference in Sheffield on the 16th September. The Trust provides grants that offer debt relief to individuals and families and partners with charitable organisations throughout the country to provide on-the-ground access to advice services for those in need. The study calculates the Social Return on Investment (SROI) of the Trust’s work. It found that in 2014, for every £1 that British Gas Energy Trust awarded in grants, some £2.4 was generated in positive impacts for British society. These included improvements in individual health conditions and savings to the NHS. For its grants to individuals and families its SROI was 1.9—almost double the financial value of its investment—whereas for every £1 given by the Trust to support the work of advice organisations around £5.5 in wider social impacts was shown to have been generated. Over the past ten years, the Trust has given grants totaling more than £56 million to individuals, families and organisations. This has created £120 million worth of positive impacts for society and had a marked impact on the lives of many thousands of people across the UK.